Cards Photo Frames - widget for decoration. Who is your favorite person is like a jack of hearts? Put his picture on your desktop. In a beautiful card framed photo of your loved one will decorate your desktop. Select any photo frame - map - ranging from deuce of clubs, ending Ace of Hearts! Be anywhere in the desktop, adjust the scale, press the corresponding button on the menu. Now the widget will be run every time you turn on your computer. To remove a widget from the startup menu, use the buttons to start windows. 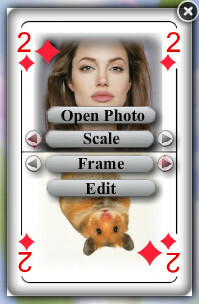 Put a photo of your hamster in the photo frame - five diamonds or can the king of hearts? For each of your photos there APPLICABLE photo frame! Collect a full deck of your friends, decorate their photos with card photo frames!